Home / contests / machu pichu / national geographic channel / Mission explorer at National Geographic Channel ! 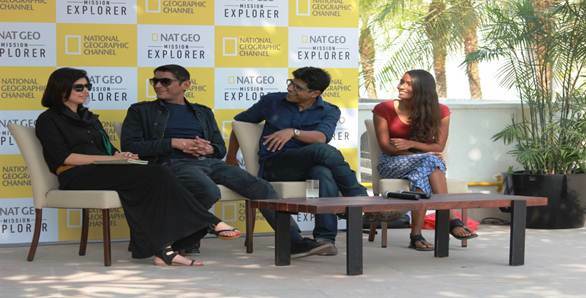 Mission explorer at National Geographic Channel ! Just log on to www.missionexplorer.in and don’t be late coz registration is only open till the 24th of December. All you need to do is upload a video of you story with a short description and that’s it! A panel from NGC will pick the top 10 entries which will be presented to the jury that’ll pick 3 winners. And the prize is- a chance to explore further via participation in an all-expenses-paid Nat Geo Expedition to none other than the exotic destination of Machu Picchu. I will also briefly introduce you to the jury who are a wonderful bunch of people- that was clear as soon as I met them. The famous MIDIval Punditz are the ones who set the trend for electronic music in India. There’s India’s first woman surfer- Ishita Malviya. The dashing duo that explored a whole 90,000 kms crossing 50 countries in a single car- Tushar Agarwal and Sanjay Madan are also on teh jury. Finally, there’s Arjun Venkatraman , the technoyogi , also known as the modern aadivasi. He is working on achieving global connectivity using inexpensive technologies with a focus on isolated communities (hence the term Aadivasi). So wait no longer and do participate to be a part of this wonderful exploration. Remember- in great attempts it is glorious even to fail. And who knows you could be the one flying to Machu Picchu.